Use a PC to format a USB thumb drive using FAT32 file system (default setting). Download the latest version of firmware. RIGHT-CLICK and select "Save link as..."
Extract the firmware file from the .zip file that was just downloaded. Load the firmware file (FT_RCFM.faa) onto the root of a thumb drive. Note: The file name must remain exactly FT_RCFM.faa Any additional characters (i.e. FT_RCFM(1).faa) will prevent the successful update of the module. Note the current DIP switch configuration. The DIP switches will need to be returned to this configuration after the firmware update is complete. Insert the thumb drive with firmware file into the module’s USB port. 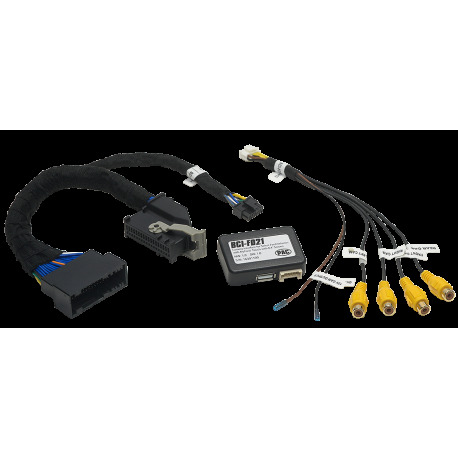 Connect the BCI-FD21 module to the vehicle harness. The update will begin at this time. While the module is updating the firmware from the USB port, the LED will flash purple. DO NOT REMOVE THE USB DRIVE UNTIL THIS LED STOPS FLASHING. When the LED stops flashing, the update process is complete. Remove the BCI-FD21 module from the vehicle harness. Remove the USB thumb drive. 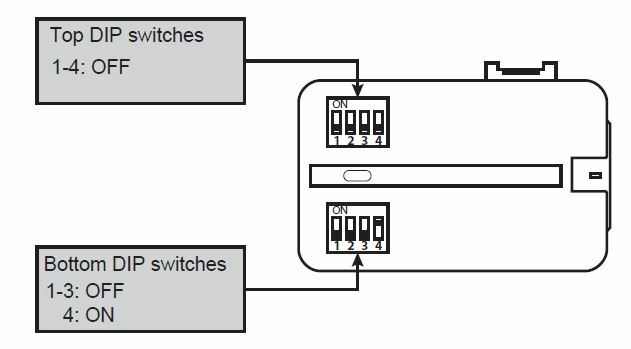 Reset the DIP switches to the appropriate configuration for your installation. (Noted earlier). Connect the BCI-FD21 module to the vehicle harness, and verify proper operation. Fixes reverse camera activation in manual transmission vehicles such as Mustang and Focus. Changes function of DIP 4 in Camera Input Configuration table to affect video display function when forcing view of rear camera while in motion. ON Position: The OE Rear Camera Display will return to Radio Function Screen when vehicles reaches 7mph. This setting is recommended for vehicles that shut down the 12V power supply to the OE rear camera over 7mph. OFF Position: You can force and watch the rear camera over 7mph at any time. Recommended for vehicles that do not shut down the 12V power supply to the OE rear camera over 7mph. Smooths video transition from one source to another in vehicles with OE parking sensor graphical display. Adds support for PTBA (Pro Trailer Back-up Assist) in newer Ford vehicles. The quick connect interface allows for an aftermarket back-up, left/right side view, and front cameras to be integrated with 2013-2016 Ford MyTouch 8.4-inch systems, giving users different views of the vehicle’s surroundings through the factory screen. The back-up input is automatically triggered by shifting the car into reverse and side cameras activated with the signal lights. The side and front camera inputs can also be manually activated instantly for added convenience. 2017 + Vehicles - Can only be used to add front and side cameras to vehicles already equipped with a factory reverse camera. GPS sync will be lost in vehicles equipped with factory navigation when the blind spot cameras are activated. Not compatible in vehicles equipped with the 360 camera system.